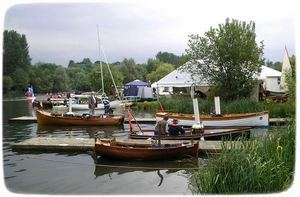 Wooden Boats by home builders on show. 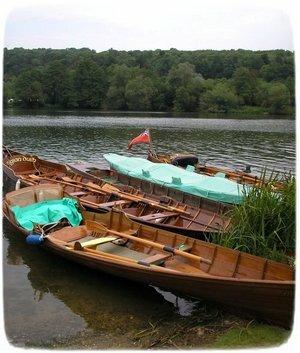 Apart from my interests in wooden boats there are several reasons why the Thames Boat Show at Beale Park is one of my favorite shows. First of all is the setting on the lush banks of the River Thames near the delightful village of Pangbourne. Then there is the refreshingly laid-back, informality of the show with none of the hustle and bustle of some of the larger more commercial shows. But what really attracts me is the emphasis on wooden boats and amateur boat building. 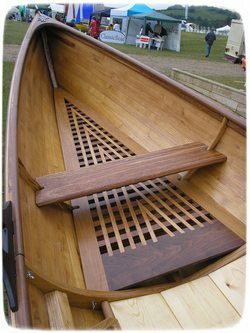 The show which originated as The Wooden Boat Show has retained its enthusiasm for traditional wooden boat building despite the problems affecting other sections of the boating industry. 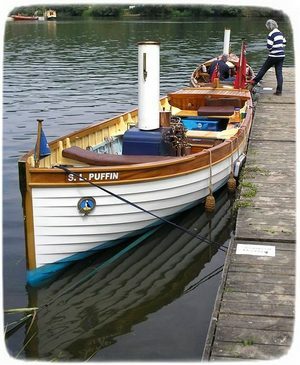 This year despite the economic down turn the range of interests covered was as wide as ever, from traditional wooden boats to restored classics, as well as covering cruising dinghies and small boats of all types for use on waterways, canals and the open sea. There was something here for everyone young and old. But the real secret of this show is that it is mounted by enthusiasts for enthusiasts with the opportunity for amateur builders to show off their craft. 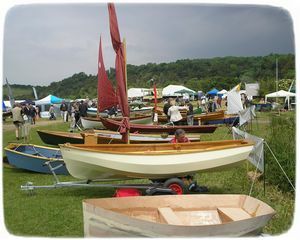 Every year there is a competition for the best amateur built boats. In the past the standard of craftsmanship of some of the entries has been so good that it has tended to discourage others from entering. 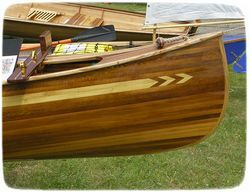 Just look at the workmanship on the Skiff on the right, its hard to believe that this in an amateur build. So this year the competition had three categories, one for the most professional looking Home-Made Boat, one for the most innovative and one for the home made boat which offered the most encouragement to beginners. 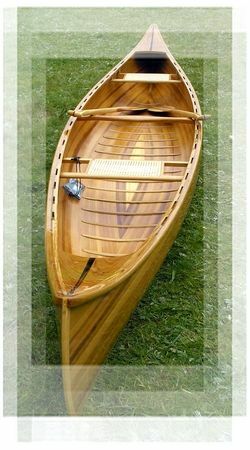 The rules are simple the boat must not be from a kit the builder must not be a professional boat builder, this truly is for the amateur. There are no big prizes it is more for the pride of achievement. The show is also a platform for enthusiast to show off their pride and joys. One group who need no encouragement are the steam boat preservation people. Now you might be forgiven for believing that this is the preserve of older men. Well I guess it is but only because these boats are family heirlooms, treated like pampered pets and not for sale. They will be passed on to the next generation eventually but old guys with a passion do seem to live forever. However, youngsters of both sexes are getting in on traditional boat building, thanks to the increasing number of Boat Building Schools, some of which were represented at the show. These schools and colleges are another sign that not all is doom and gloom. 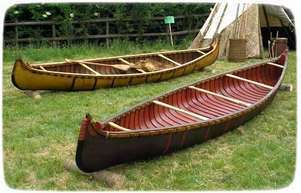 Their courses in traditional boat building methods from short to full time are being filled not only with youngsters starting out on a career but those wanting a midlife change of direction and oldies looking for a pastime. 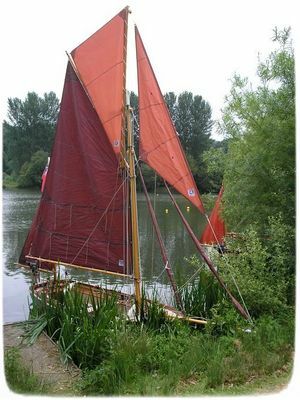 The courses cover everything from basic woodworking skills to restoration work and full scale boat building such as the recreation of Shackleton's Boat, the "James Caird", which was on display at the show. The "James Caird" was the salvaged lifeboat boat in which Shackleton made his heroic crossing of the Weddell Sea after his ship the “Endurance” became trapped in the pack ice. The part built "Caird" which was on show was constructed by the students using European Larch on steamed Oak. She is copper fastened with keel stem and a stern of grown Oak. She will eventually be caulked with cotton and white lead putty, and then be decked in and canvassed. There were also plenty of trade stands almost exclusively small boat building businesses. These stands are not staffed by sales people but the boat builders themselves and it is their enthusiasm for their craft, both the skills and the vessels which helps give this show its buzz. These are people making a living from doing what they love and who take great pride in their skills. The show also taps onto the growing trend, fuelled by environmental consideration to stop trying to challenge nature and instead, look for a way to enjoy it slowly, respectfully. This ‘green’ tendency was enthusiastically being promoted by the timber suppliers at the show. Ethically sourced exotic woods from sustainable forests were being promoted by specialists with a wealth of knowledge on different species and their application. Among the other venerable attractions was the legendry James Wharrem of Wharrem Catamaran fame. At the age of 80 James has recently completed a 4000 nautical mile voyage, the "Lapita Voyage", from the Philippines to the remote Polynesian islands of Anuta & Tikopia to donate two double canoes to the islanders. There was also plenty of other stuff going on such as craft stalls, a specialist food market, cookery workshops, dancing displays and live music. But to round off the relaxing laid-back, informality the star of the show, apart from the wooden boats of course, was the beer tent with its selection of real ales.